Blues for Lost Souls was back on August 11 and raised $18,500. The total to date since its humble beginnings in 2013 equals just over $140,000 all up … not too bad considering it’s a return from only seven events, including Blues for Bali, earlier this year. The monies raised has enabled so much within our homeless communities and charities. Founder Greg Dodd and his wife Jan are departing Wednesday to start a new phase in their lives. What Blues for Lost Souls looks like from here on into the future is presently unknown, but I’m sure it will be back next year. OK, some happening things in the coming weeks. Sleepy Hollow is hosting a double header of two local bands. First up is the Ethan Farmer Band. Ethan is a blues and jazz guitarist based in Geelong. He is a much sought-after talent, playing on-stage alongside Australian music legends like Jimi Hocking, Geoff Achison, Marco Goldsmith, Sammy Owen, Wayne Jury and Chris Wilson. The Ethan Farmer Band includes the supremely talented brothers Kane and Sam Watts (drums and bass), who regularly perform jazz and blues gigs in Melbourne and across Victoria. 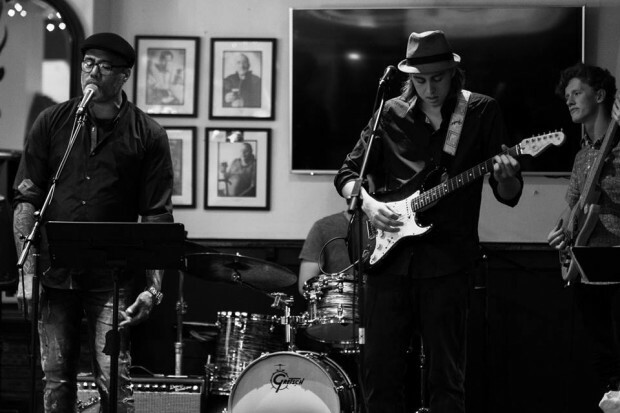 The trio present a blend of blues-based rock tunes with a sizzling jazzy inflection, as well as their interpretations of classic songs from artists like Howling Wolf, Robert Cray, Tracy Chapman and others. The second band is Pl@n B, who have been making a name on the Bellarine. Formed two years ago, the Bellarine Peninsula based Pl@n B is a four-piece rock, blues, soul and dance band that has developed a big following after regular gigs at Portarlington’s iconic music wine bar Saints and Sailors. Pl@n B band’s mix of electrifying, floor stomping, danceable music is dynamic. New bass player Gerry, Andrew’s drums and Graeme’s guitar bring the groove to match Jenn’s big voice to power an eclectic mix of vintage hits from the 50s to the 60s plus a mix of the favourite Aussie anthems. There’s a second Chris Wilson benefit still to come at Pistol Pete’s on the 30th of August. There are two shows, the first from 6 to 8pm and the second from 9 to 12pm. That should cater for all ages! Ethan Farmer Band and Pl@n B will be at Sleepy Hollow Blues Club on August 28th and our second local Chris Wilson Benefit on the 30th at Pistol Pete’s.